By admin | September 27, 2016. Conor ‘The Notorious’ McGregor will face Eddie Alvarez for the lightweight championship belt at UFC 205. 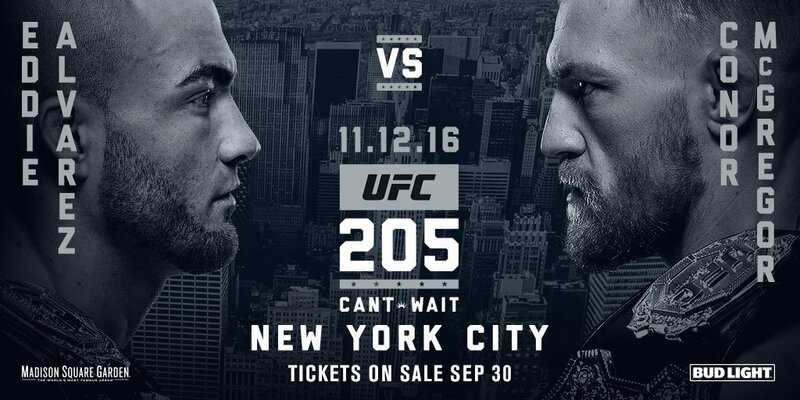 UFC 205 will be the first UFC event to take place in Madison Square Garden in New York on November 12th. The Notorious Irishman will have the chance to set history once again by becoming the only fighter in UFC history to hold belts at two weight divisions simultaneously. McGregor currently holds the 145lb featherweight title and despite many believing he would have a long awaited rematch against Brazil’s Jose Aldo he will now fight at the 155lb level for the first time in the UFC. McGregor was set to have a lightweight title match last year at UFC 196 against Rafael Dos Anjos, who has since been dethroned by Alvarez. Dos Anjos pulled out of the fight due to injury leaving the Irishman to fight Nate Diaz instead. Many believed that lightweight champion Alvarez would face the number one lightweight challenger Khabib Nurmagomedov who is still undefeated in his professional fighting career.